Highlights from December’s Readings, mostly on the theme of Humour Just how varied humour can be was soon apparent. ‘I was way too fast, it just couldn’t last; Muhammad, Muhammad Ali Floats like a butterfly, stings like a bee, Muhammad a black superman Just try to catch me, catch me if you can.’ Our feature poem didn’t attempt to be ‘funny’ yet there was humour in John’s punchy ‘Mohammad Ali’ set to music from an electric keyboard, and relayed with a speaker and four male voices. Altogether a tremendous effort! 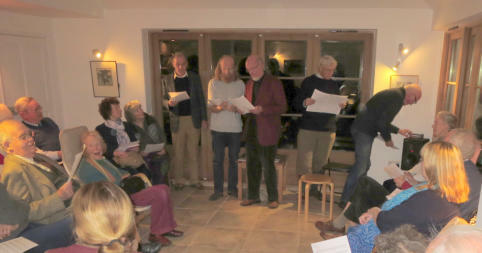 And much enjoyed by a full house who joined in the chorus. Pippa’s ’50 years after….’ was hilarious, largely because of its delivery and because her story was true one about Dylan Thomas. Evelyn’s ‘Ode to Mum at Christmas’ was music-hall comedy, another performance piece, and a nod towards the season taken up in Peter’s choice of Kate Bingham’s ‘Centro’. This is a ‘found poem’ in which each line was borrowed from the first line of an existing poem, to sometimes ludicrous effect. Sally L’s ‘Advent in Aleppo’ was a sobering reminder of people due to face difficult times during our festivities. Hilda’s ‘Thoughts from the mat’ was a pertinent paean to the power of yoga. ‘Asanas’ and ‘Savasanas’ were new words to me (postures adopted when performing yoga). Betty ridiculed King’s Lynn’s parking regulations. Spike Milligan’s absurd/sublime verse with its anarchic kick probably competes with that of Roald Dahl for first place as a children’s favourite. But Dahl’s wicked ‘Red Riding Hood’ brought along by David C, was new to me. Equally prolific and popular were two other plain language poets we heard from: WS Gilbert, represented by ‘Pinafore’; and Wendy Cope, by ’The New Regime’ and ‘Another Unfortunate choice’. Ogden Nash’s ‘Shrinking Song’ took me back to days when everyone regularly, darned, and almost every High Street boasted a Haberdasher Stores. Another small world that spoke to us as year-round porridge consumers, was Galway Kinnell’s ‘Oatmeal’. Kinnell (1927-2014) won a Pulitzer for poetry that often drew on his involvement with civil rights and protest against the Vietnam War.